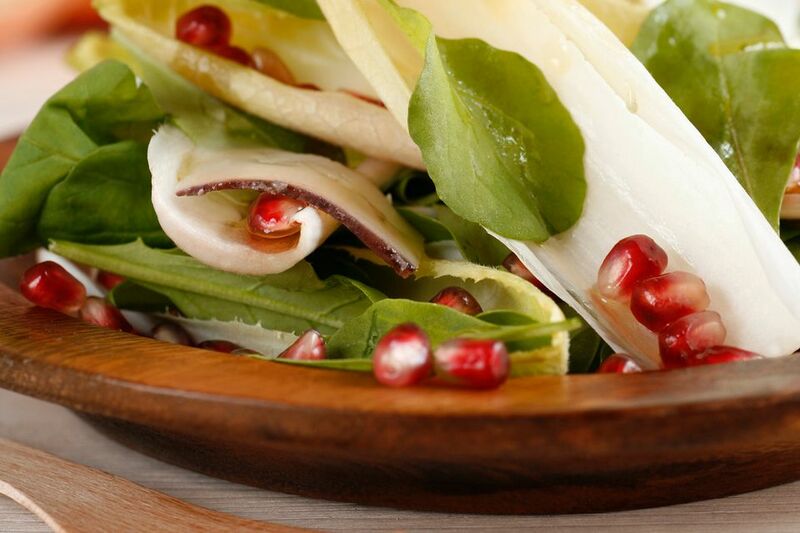 This recipe for pomegranate vinaigrette is great as a salad dressing or as a bright sauce when drizzled over shrimp or salmon served as an appetizer or main-course salad. Fresh or bottled pomegranate juice will work but fresh is best because you will have the seeds for garnish. If using fresh pomegranates, you might want to do the work of deseeding and juicing the night before preparing this. It makes the work go so much faster. Eastern Europeans developed a fondness for pomegranate from their Middle Eastern and Mediterranean neighbors and they are grown in some parts of Eastern Europe. In a medium bowl, mix the pomegranate juice, vinegar, and honey, and let sit for 10 minutes. Whisk in the oil and adjust the seasonings. Mix in pomegranate seeds and chives, if using. Refrigerate until ready to serve. Stir thoroughly before using.